Innovative Formulas Includes Nutrients, Vitamins and Extracts for Maintaining Vibrant Color, Shine and Healthy Hair. We truly feel this system will help everyone achieve the thicker, stronger, longer hair they desire while retaining the vibrancy of their natural or color-treated hair. D.C. Labs, nationwide provider of the luxurious Ovation Cell Therapy® Hair & Scalp Treatment, announces the arrival of our new Color Protection System. The three-part System includes the Color Therapy Shampoo, Cell Therapy Hair and Scalp Treatment and Color Therapy Conditioner which work synergistically to protect color and help hair become thicker, stronger and longer. The sulfate-free Color Therapy Shampoo gently cleanses hair, while protecting against wash-out and fade-out. Formulated with a special blend of powerful ingredients including Quinoa and Marine Algae extract, strands are shielded from UV rays and heat styling. The Color Therapy Conditioner locks in moisture while nourishing hair with a unique blend of natural, reparative ingredients including Amino Acids, Marine Algae extracts and Aloe Vera. Hair retains vibrant color while conditioning agents hydrate strands and add shine. Ovation’s Color Protection System is exclusively available online at http://www.ovationhair.com and is the featured product for keeping highlights bright, lowlights low and color vibrant. The philosophy of Ovation Hair is to meet clients’ high expectations with quality, nourishing and rejuvenating products that demonstrate proven effectiveness. Ovation Hair has been helping clients achieve healthy hair since 2007. Their flagship product, Ovation Cell Therapy is proven to deliver thicker, stronger, longer hair. 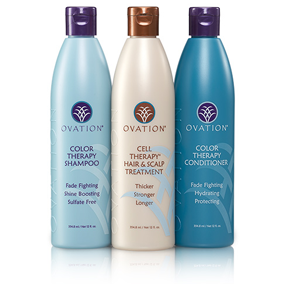 Ovation products include high quality ingredients, demonstrated to be safe and effective to create healthy hair. The hair care products are developed as a natural alternative designed to rejuvenate hair to look thicker, stronger and longer. For more information please visit http://www.ovationhair.com.